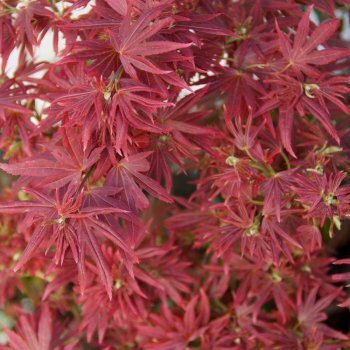 A relatively new variety (during the 1990s) which is a sport of Acer palmatum Bloodgood, 'Shaina' is a mid sized Japanese Maple with an upright, slightly columnar form and very good colour all through the spring, summer and autumn. It has deeply divided leaves which are vibrant bright red in spring, dark ruby red in summer and a striking crimson tone in autumn. Like all Japanese maples, 'Shaina' prefers a sheltered situation, in partial shade or sun and acid or neutral soil. Acer palmatum Shaina will grow to approximately 2.5-4m in 20 years. Pot grown Shaina Japanese Maples can be planted at any time of the year. Firstly, remove all weeds and grass within a metre of your desired planting hole then dig a square hole as deep as your root mass and approximately 2x as wide. To help your tree establish more effectively, we advise sprinkling root grow in the hole, especially if you have poor soil.